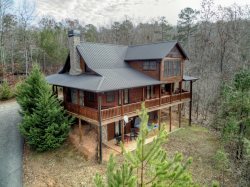 Visit the North Georgia Mountains and experience a little bit of `My Mountain Paradise`. Convenient to downtown Blue Ridge, Georgia, yet far enough away to avoid the hustle and bustle of town. Everything is within a short drive; hiking, fly fishing, the casino, breweries, wineries, Mercier`s Apple Orchard (a destination within itself), shopping, restaurants and much more. Visit us to make some memories that you`ll hold on to for a lifetime! My mountain cabin rentals was wonderful to deal with. Everything was in the packet when we arrived at the office.